All this week, passers-by outside the Rowe Building will see Commerce students around the clock with sleeping bags and bright orange shirts. They’re participating in a campaign called 5 Days, collecting donations for Phoenix Youth Programs, a non-profit Halifax organization that serves youth between the ages of 11 and 24, many of whom are experiencing or at risk of homelessness. Julia Penney, VP external of the Dalhousie Commerce Society and this year’s organizer, has been looking forward to this year. She helped organize last year’s 5 Days campaign, but on the night she was scheduled to sleep outside, a storm made it too dangerous to do so. This year, she’s participating for all five nights, and she’s excited to continue building on the success of previous years. “It’s exciting to see how big it is already,” she says. The campaign officially started Sunday afternoon, and the students are already over a quarter of the way to their goal. This is the sixth year that Dalhousie has participated, raising over $65,000 since it began. This year, Julia and the Commerce Society hope to add $25,000 more. 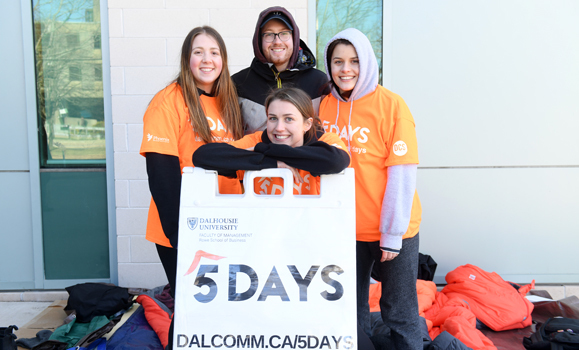 The Dalhousie Commerce students are the only Atlantic Canadian team taking part in the national 5 Days campaign. During the campaign, students must attend classes and extracurricular activities as they normally would, but otherwise you’ll see them outside the Rowe building, collecting donations and having conversations with people about Phoenix. All of their meals must be donated by supporters, with anything left over donated to Phoenix, along with the money they raise. 5 Days students, clockwise from left: Julia Penney, Donald Eastop, Christina Erb, and Kara Feeley. Julia and the Commerce Society plan to make it bigger than ever this year. There are 20 Commerce students signed up to participate. Julia and Commerce Society President Donald Eastop will sleep outside every night of the challenge, while others will join as guest sleepers for a night. Julia hopes that having more students involved will mean a bigger network, more awareness and more donations. They are also planning fundraising events to complement the challenge. A comedy night kicked off the festivities last week, and they'll celebrate the end of 5 Days with a karaoke night at the Grawood Pub on March 29. The student team is challenging their peers to sponsor a youth by donating $12.60, which is what it costs Phoenix to provide services to a youth for one day. That translates to $63 for those who want to support someone for all five days, or about $391 for those who can support someone for a month. You can support the campaign by donating to the students outside the Rowe building or online through the Dalhousie team’s website. Check the Dalhousie Commerce Society’s Facebook page for full details on their fundraising events happening March 29. Left to right: Benoit Aubert (director, Rowe School of Business), Marianne Hagen (alumni and student engagement, Faculty of Management); students Julia Penney, Donald Eastop, Kara Feeley and Christina Erb; and Vivian Howard (interim dean, Faculty of Management).